If your baby is constantly fussy and crying, you may wonder if she has started teething. When will your baby start teething? That is, as with any other baby milestone, quite individual. The majority of babies will have their first tooth between four and seven months, which means that teething pain can start even earlier. It is, in fact, possible for a baby to be born with teeth. But that is so rare that we'll just mention it in passing. Most babies will get their bottom front teeth first, followed by their top front teeth. So, if your baby is fussy and you are looking for signs of teeth, that is where you should be focusing your attention. At first, the gums will turn sore and swollen, and a white spot will emerge underneath. Every parent wants to know what they can do to relieve teething pain. Unfortunately, it is not possible to eliminate all pain for your little one. 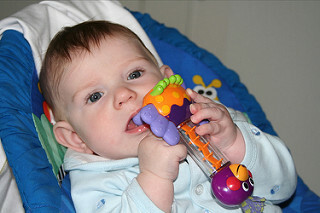 But you can make the teething process a little easier by giving your baby a teether. These come in many kinds, and you may need to try a few before your baby decides she likes one. We liked teethers with fluid, that can be put in the freezer, in our family. Some babies prefer biting on foods to ease the pain and help the tooth erupt, but that is only suitable for those old enough to eat solids which is six months and up according to most research on the topic. Additionally, you can give Tylenol or another over the counter pain killer suitable for infants. Discuss this with your baby's pediatrician. There are also homeopathic treatments and teething gels with local anesthesia available. 45 years old with extream jaw pain.